*John Carroll Power (1819-94), a Kentucky native and failed farmer, was appointed custodian on Oct. 28, 1874, the day before the tomb was opened to the public. 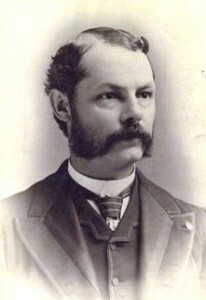 He held the office until his death on Jan. 11, 1894. Power’s gravestone, in a section of Oak Ridge Cemetery just west of the tomb, notes that he was on duty the night of Nov. 7, 1876, when “ghouls” attempted to steal the body of Abraham Lincoln. Power also was an industrious local historian and booster. His books included volumes on Abraham Lincoln’s life, death and burial, the 1876 attempt to steal Lincoln’s body, early Sangamon County residents and the history of Springfield. *Major Edward S. Johnson (1843-1921), who replaced Power, was a Springfield native and schoolmate of Robert Lincoln. 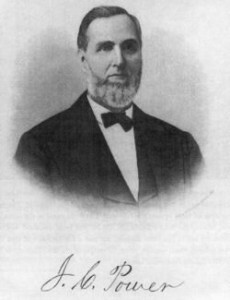 Johnson, who had been a sergeant with the Springfield Grays militia unit, joined Illinois’ 7th Volunteer Infantry a week after the attack on Fort Sumter and served until July 1864. He operated hotels in Springfield and Chicago before becoming tomb custodian. Johnson, appointed in 1895, oversaw the complete reconstruction of the tomb in 1900-01, and he and his wife, Laura (1847-1915), were among those present when President Lincoln’s body was permanently interred in a concrete vault below the burial chamber on Sept. 26, 1901. Johnson was the first custodian to live in the custodian’s home, which was completed next to the tomb in 1896. He remained custodian until his death in 1921. He is known to collectors as “the man with a million relics.” Over four thousand of these relics are pictures of Lincoln and include over 200 different settings. More deterioration led to a second extensive reconstruction of the tomb in 1930-31. When the work was finished, the designers’ intent was to make the interior of the tomb a museum all its own, with an emphasis on Lincoln’s words and small reproductions of famous Lincoln statuary from around the U.S. But Fay wasn’t ready to give up on his displays. Fay, approaching age 90, stepped down as custodian on Jan. 1, 1949; he died that October. *Earl Owen Fay (1885-1954), who had moved to Springfield to care for his aging father, became assistant custodian before Herbert Fay’s resignation and was named custodian by Gov. Dwight Green when his father retired. However, the younger Fay had spent most of his life in DeKalb, where he was advertising manager for Wurlitzer organs, and he retired from the tomb position in June 1950 to move back home. *George Cashman (1897-1983) was custodian from 1951 until 1975. Cashman, a native of Boston, was an engineer by training and went into engineering sales before moving to Springfield in the late 1940s. Here, he opened a camera shop, according to his Illinois State Journal obituary. 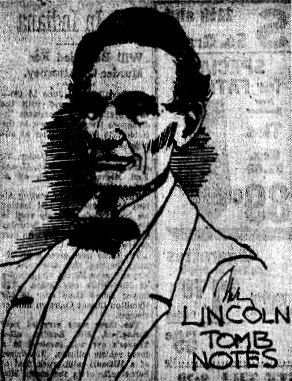 “He was well known for presenting a slide program of the Lincoln Story he had assembled during his sales travel,” the obituary said. That apparently led to his appointment as tomb custodian by Gov. Adlai Stevenson. Cashman was prominent in such national groups as the Sons of Union Veterans as well as local historical groups, helping found the Springfield Civil War Roundtable and the Sangamon County Historical Society. Historically a purist, Mr. Cashman spent a lot of his time in the pursuit of Lincoln and Civil War minutia. He has clarified various points of geneology, written a newspaper series on various historical topics, delved into documents relating to the Tomb’s original construction and design, and amassed a large amount of data on the Lincoln funeral. 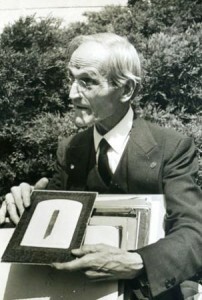 Cashman talked about visitors he had met and the heritage of President Lincoln and the tomb in an oral history interview conducted by Brian Alexander in 1972. Cashman was the last person to hold the title of custodian and also the last resident of the custodian’s cottage. Upon his retirement in January 1976, the state of Illinois reorganized administration of the tomb, and Carol Andrews was named site superintendent. The residence became the site’s management office. This entry was posted in Historic Sites, Histories, Lincoln Tomb, Museums, Presidents, Prominent figures. Bookmark the permalink.